* Or read recklessly on to take to the continent as the "traveling companion" of the spirited and adventuresome Lady Evangeline? * ...or yet another intriguing fate? My Lady's Choosing wasn't a book I happened to stumble upon on Goodreads or in the traditional sense; at a bookstore. It was, instead, a title that was introduced to me, with much high praise, through Penguin Random House of Canada. 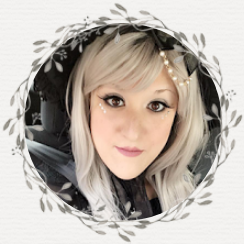 It was pitched as a unique and interactive romance, perfect for readers who like to choose their own happily ever afters. My first experience with such a novel was with R.L. Stine's Escape from the Carnival (1995). It was a "choose your own scare" title, the first of many in that series, and I was instantly enthralled by the very idea that I could choose exactly what the hero/heroine would do and say, and take them exactly down the path I desired. With that said, My Lady's Choosing by Kitty Curran and Larissa Zageris became instantly intriguing to me. 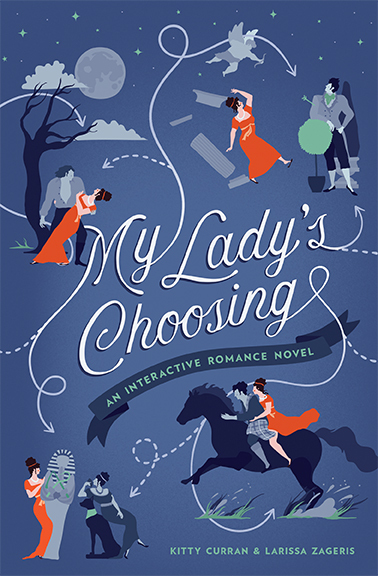 My Lady's Choosing by Kitty Curran and Larissa Zageris can be approached in many different ways. From my experience, readers can immediately choose exactly how they wish the heroine to interact with a large array of different characters (best friend, love interests, etc). Each opportunity can be found to lead the heroine either closer or futher to her love interest, depending on their choices. In that regard, I immediately noticed that the tale could go far further than Sir Benedict Granville and Captain Angus McTaggart. In fact, there are far more characters I, personally, have yet to discover, including an opportunity to travel to Egypt and meet more intriguing characters. However, I did complete the paths for both Benedict and Angus, as they seemed to be the shortest and most easily accessible through the decision making process. 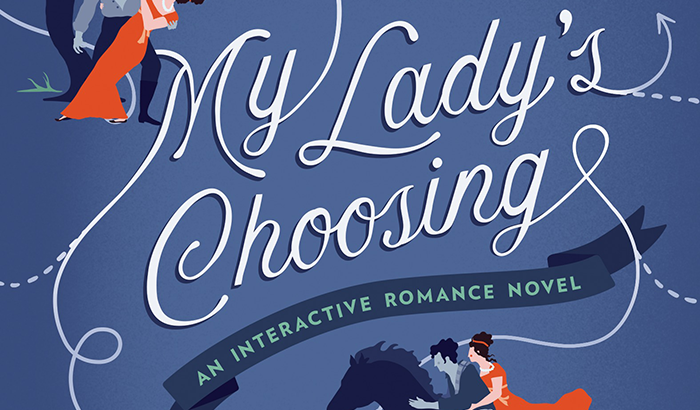 Overall, I greatly enjoyed My Lady's Choosing: An interactive Romance. It was easy to read, the characters were intriguing immediately upon introduction, and I found it to be a breath of fresh air in comparison to other historical romance novels. I highly recommend it to romance readers who are looking for something a little bit different, who are certainly intrigued behind the idea of the title, and whom are also looking for a more diverse cast of love interests they can pick and choose. I'm currently reading this and having fun! I'm on my second time so I can choose differently and see where I end up this time.